The technology isn’t new, but Facebook has recently pulled another update out of the bag that could well help it become top dog once again. Live streaming of video from your phone blew up when Periscope started to get popular, and it has become a staple for many of the brands that want that extra level of content for their company. Live streaming is good because it can grab you an audience right there in the moment, and allow you to communicate with them. If you play it right (and many brands do with Periscope) you get a webinar, on the go. It has been used for press events, webinars (obviously, but a little more dynamic than the usual kind) and instant, branded short chats with an audience. Video has always been a killer on Facebook, but now it seems to be changing again. It’s popular stuff too. The two first big players in the live streaming were Periscope and Meerkat. Meerkat is nowhere near as big as Periscope when it comes to users, but it does have millions of users (it is pivoting away from live streaming because of the high competition). And Periscope, well, it’s kind of big. So Facebook is now making live streaming a big deal. You can just jump in and hit the button. Facebook Live is that simple to use, and many brands are quickly picking up the challenge. All you have to do is click on the button and away you go. But of course, you still need to know where to go with it and what to do. The best examples are very simple. If you’re a business that does something exciting people can watch you do (rather than a company that finalises insurance, for example) you are onto a winner. Successes so far include a tattooist who literally shows her inking jobs live on Facebook Like. It’s immediate, it’s visual, and it is very successful. This is a perfect example of an individual who sells a service, showing how the service fills a need. So it works well for those brands who have a visual, immediate impact with their work. 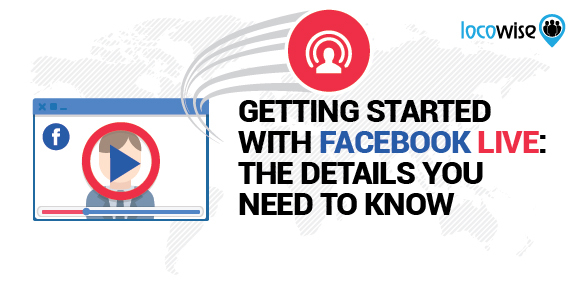 If you don’t, you can still utilise Facebook Live by sending information with it. For decades now brands have seen the value and payoff in branded content that is full of valuable information. It helps the audience and builds trust. A simple broadcast on Facebook Live about topics that people who buy your stuff are interested in will work wonders if it is done consistently well. It’s the consistently well part that some brands struggle with. First of all, don’t even try to use the service unless your signal is strong. We’re talking WiFi if you can, but definitely 4G if not. Live video is as dynamic and demanding as it sounds and you can’t get it right if you’re struggling to pick up a signal. When it comes to the actual delivery of what you have to say, speak clearly. Live video has an unfortunate habit of sounding a little muffled, and simply because people do not use the microphone on their phone carefully. Get your mouth close and speak as clearly as you can. If you’re in an area that has a ton of background noise (people shouting, glasses clinking, that sort of thing) that could seriously compromise the quality. Keep the video short and snappy. If you’re doing lots of work in different locations and on different topics, you can keep videos short to even the five minute mark. But we recommend that you look at ten minute videos as an average. It gives you plenty of time to get your message across but also ensures that you don’t outstay your welcome. Once you’ve created your commercial video (because that is what it is) you then need to ensure that right at the end you have a very clear call to action. Don’t forget that this is where people are going to either think about contacting you for a service or product, or never give you a second thought ever again. Make it memorable and make it clear, and people will realise that you are a brand that deserves attention. We thought we would focus on just a couple of high quality examples here. Facebook Live is now taking off, but it is already quite overcrowded due to the very low barrier to entry (got a phone? You’re live). Some brands have taken on the challenge with gusto, however. Benefit is a large, established cosmetics brand. It has a presence all over the world, and also (thankfully) possesses a sense of humour. Every Thursday, two people hold a live stream on Facebook Live for Benefit. They drink wine and take questions. It’s called ‘Tipsy Tricks with Benefit’ (see what they did there?). It works because it allows people to drop in on an informal, fun little chat. At one point the stream had nearly 60,000 viewers and easily comes away with an average of 2,000 per broadcast. Take a look at it, and you’ll see how Benefit has effortlessly worked to create something useful, engaging, and bitesize. Again a perfect match up of a high quality, fun brand with a platform that rewards creativity and freshness. How did this brand take advantage of the Facebook Live approach? It simply ran a tour of the facility, which is a kind of exclusive thing anyway. Right at the end it put together a little demonstration of how to make a wedding cake. Using donuts. The stream was a huge success and ended up in a massive spike in traffic to the brand’s main site. This shows how using Facebook Live to ensure that you’re getting across a fast and fun (and unique) piece of branded content can result in bigger reach and engagement. Facebook Live is still relatively new. This is a big deal because it is easy to make mistakes/and get carried away. If you’re still unsure, stay under the radar and wait to see how brands in your industry sector use the platform. We recommend that if you are going to use the platform, focus on some fun and upcoming events type stuff. Anything that is relevant and current plays well. Have a new product to release to the market? Unbox it before someone else does. Want to show how you get the hairstyle just right for your most dedicated customers? There’s Facebook Live for that. Do it consistently but not every day at first. The more it seems like a novelty in your feed the better. Brands now have to be very careful how they approach marketers anyway, according to new Facebook rules. So getting your Facebook Live video right deserves time, effort, and the following of clear guidelines. In other words, make it a serious part of your marketing, and do it right. This way, you’ll build up a library (the video stay in your feeds forever) that continues to add value over time. And that’s yet another strand to your marketing. Need the very best (and latest) metrics of your social media marketing campaigns? How about a two week trial of Locowise, consistently the best and most attractive metrics service online right now. See how every aspect of your social works, including instant and practical recommendations.